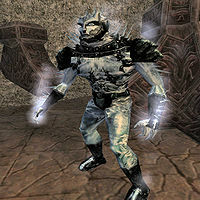 Nomeg Gwai is a frost atronach in Dubdilla, lower uncharted caverns, straight south of Vos. He is the lover of Molag Bal's daughter, Molag Grunda. Molag Bal doesn't think too much of him and wants them both killed. This page was last modified on 18 August 2013, at 04:32.